Nvidia NVS 310 PCIe x16 videokaart kopen? | That's IT! 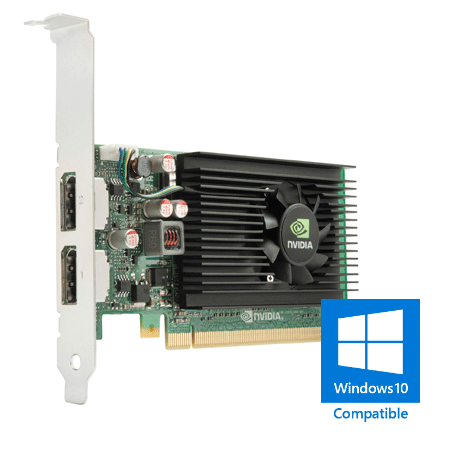 Originele professionele Nvidia Quadro NVS310 PCI-express Dual-Head Full-Height graphics board met PCI-Express X16 interface, 512MB DDR3 geheugen en 48 CUDA cores. Gebruikt, maar uiteraard in perfecte staat. Wordt bulk in antistatische verpakking geleverd. Take advantage of the industry's first architecture designed to dynamically allocate graphics processing unit (GPU) resources for optimized performance. Part of the NVIDIA Forceware unified software environment (USE), UDA guarantees forward and backward compatibility with software drivers. The latest driver also supports all current NVIDIA products, greatly simplifying upgrades. Double the data transfer rate up to 5 GT/sec per lane for an aggregate bandwidth of 16 GB/sec bi-directional (8 GB/sec in each direction). Experience a super-quiet desktop environment thanks to a highly reliable fansink that efficiently cools the graphics without taxing the system fans. Get the high-throughput memory needed to interact with large textured models, or display an HD video on each of the display outputs. Enjoy seamless compatibility with x86 32 and 64-bit microprocessor architectures, as well as operating systems from Intel/AMD and Microsoft/Linux. Discover maximum flexibility for single large-display or multi-display options. This software provides unprecedented end-user control of the desktop experience for increased productivity. Get simplified IT administration and deployment throughout your enterprise. Regardless of desktop system (standard tower PC, workstation, small-form factor system) or the display type (LCD, DLP, plasma), NVS 310 fits into any existing installations with no disruption. An exhaustive toolset maximizes your system uptime by enabling seamless wide-scale deployment. Allow remote query and control of graphics and display settings for systems spread across your installations. The ideal solution for seamless taskbar spanning, as well as transparent scaling of any application across up to eight displays. This technology works over multiple displays or one ultra-high resolution display using a single or multiple NVS graphics cards. Mosaic Technology is supported on Win 7 and Linux only. Provide compact and secure connectivity for ultra-high-resolution panels (up to 2560 x 1600). These connectors enable maximum range, resolution, refresh rate, and color depth to support the latest display technologies. 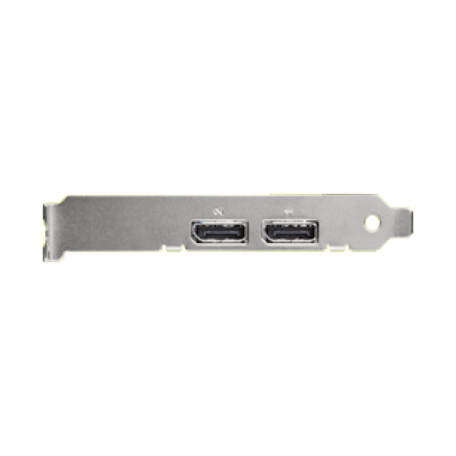 Get great flexibility and advanced cable management capabilities by enabling DisplayPort 1.2 display features that include Multi-Stream Technology and Stream Cloning. Leverage internal TMDS and DisplayPort transmitters to deliver crystal-clear image quality for high-resolution digital displays. Enable transport of video and audio to HDTVs and other HDMI-capable devices (via DisplayPort to HDMI adaptor). Experience the industry's best image quality, sharpness, and pixel tracking for both analog and digital LCDs, DLPs, and plasma displays with resolutions up to 2560x1600. Get a high-definition video processor with specialized software to deliver unprecedented picture clarity, smooth video, accurate color, and precise image scaling for SD and HD video content. Features include high-quality scaling, spatial temporal de-interlacing, inverse telecine, and high-quality HD video playback—all with low CPU utilization and power consumption. This next-generation operating system will mark a dramatic improvement in the way the OS takes advantage of the GPU to provide a more compelling user experience. By taking advantage of the GPU for both graphics and computing, Windows 7 will not only make today's PCs more visual and more interactive, but also ensure that they have the speed and responsiveness customers want. Provide EnergyStar compliance with low maximum and low idle power levels. Reduce overall system energy costs by intelligently adapting the total power utilization of the graphics subsystem based on the applications being run by the end user. This power-optimized design helps reduce Total Cost of Ownership (TCO) and increase reliability. Enable dramatic increases in computing performance by harnessing the power of the GPU. NVS 310 contains 48 CUDA parallel-computing cores compatible with all CUDA-accelerated applications.